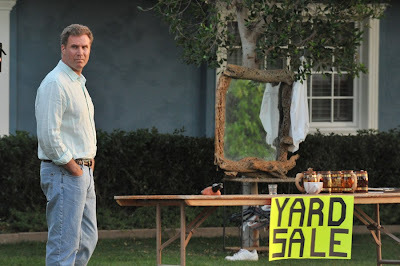 When I think Will Ferrell, I think two things right away. The first thing I think is hilarious. Whether it’s back in his Saturday Night Live days or from films like ANCHORMAN or TALLADEGA NIGHTS or even one-off projects like his one-man show on Broadway, where he took on George W. Bush in You’re Welcome America: One Final night with George W. Bush. 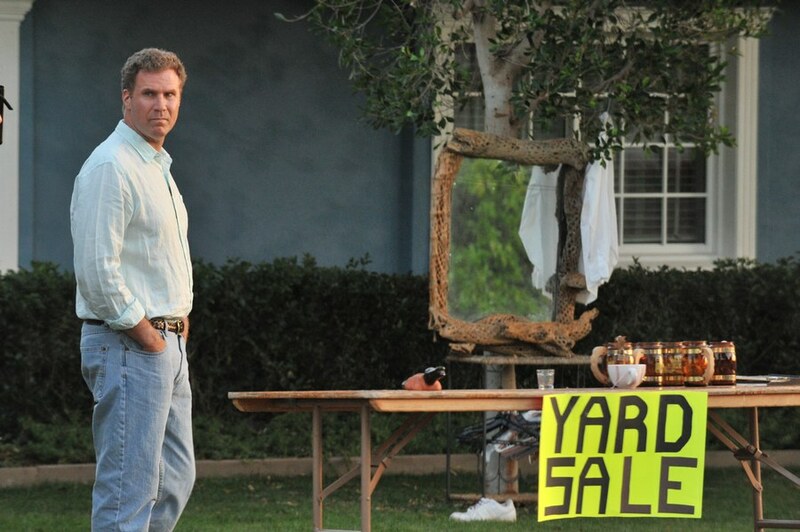 The other thing I think of instantly when I think of Will Ferrell is how freakishly tall he is. After meeting him in person though, I can say that everything I thought I knew about Will Ferrell is wrong. First of all, he is only 6’3”. Sure, that is still tall but for some reason, I always imagined him as a giant. Maybe it’s the whole ELF thing. More importantly though, sitting down to interview Ferrell is actually quite a sobering experience. That said, this might have something to do with the tone of the film he is promoting. 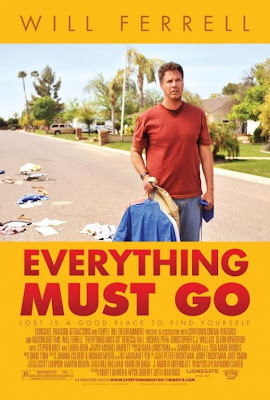 EVERYTHING MUST GO is most certainly not a comedy and Ferrell wants to ensure we are all clear on that ahead of time. I’ve seen EVERYTHING MUST GO. It’s definitely clear. Ferrell plays Nick Halsey, an alcoholic whose drinking problems have gotten him fired from his job after many years of service. On the day he loses his job, he stops off at a convenience store to make sure he has plenty of beer and then heads home to his wife. 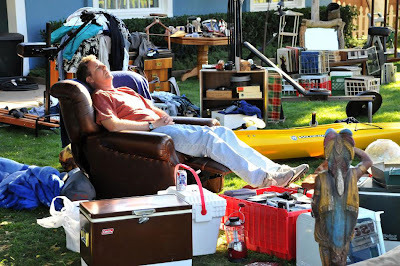 When he arrives though, he finds all of his belongings strewn across his lawn, the locks changed and his wife long gone. Nick has had better days. The gift of Nick Halsey originated in a short story by Raymond Carver, entitled “Why Don’t You Dance?” It was adapted for film and directed by first time filmmaker, Dan Rush (shown with Ferrell above). The story was drastically expanded from its original form and finds Nick selling his stuff to anyone who will take it and finding solace in two unlikely and completely different neighbours (Rebecca Hall and Christopher Jordan Wallace), both just as lonesome and lost as he is. Thanks for this. I loved Everything must go, like I have loved Stranger than paradise and Melinda & Melinda(an unsung Allen film). Ferrel is the man. Much of his acting is strengthened by his human charm and a very relatable air, and this film taps this aspect damn well. I also thoroughly enjoyed Stranger than Fiction and, to a much lesser degree, Melinda and Melinda. Ferrell was a pleasure to speak with and clearly takes his craft seriously.